InterSoft International, Inc. produces award winning products designed to run on Microsoft Windows based workstations, allowing connectivity to IBM, UNIX, Windows and VMS based host computers. Our products are used worldwide by individuals and companies to meet their client / server needs. The robust nature of NetTerm allows it to be used by the military, IBM, federal courts, National Institutes of Health, public libraries, automobile dealerships and thousands of individuals requiring access to Internet accounts, public library systems and their database connectivity requirements. Professionals within the medical, financial and law related industries use NetTerm to search diverse databases located all over the world. 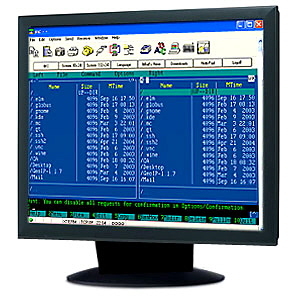 The award winning NetTerm is a robust, configurable terminal emulator designed for Internet and intranet connections with support for Telnet, rlogin, dialup, and other connection protocols. NetTerm delivers precise VT100, VT102, VT220, XTERM, SCO ANSI, ANSI and other popular terminal emulations. All of NetTerm's emulations support ANSI color. NetTerm supports the login process with an internal scripting language. The NetTerm printing abilities has been acknowledged as providing the most feature rich terminal printing support of any terminal emulator. Both text and graphic reports can be produced on any Windows based printer, whether locally or remotely attached. The unique ability to bypass the Windows based printer drivers allow reports to be sent directly to the Windows spool queue. This allows host programmers to control printers through its native application programming interface, providing exact font, font size and graphical content. Fully featured evaluation copies of all the InterSoft International, Inc. products can be downloaded and used for a period of sixty days. Use of the products after the sixty day evaluation period requires that a software license be purchased. All of InterSoft International, Inc. products are licensed by user, and include liberal discounts for quantity purchases.